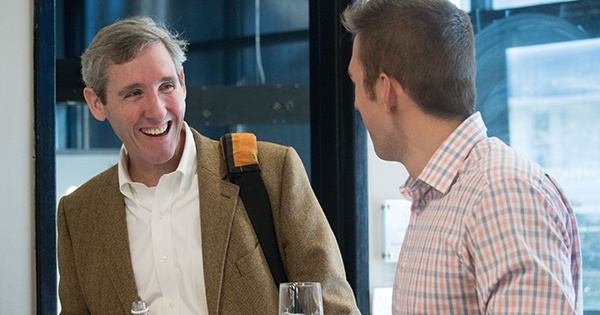 University of Delaware faculty are invited to the UD IDEA Network Third Thursday Faculty Social from 4 to 5:30 p.m., Thursday, Nov. 16, at the Venture Development Center (VDC). This program features UD faculty and an industry representative discussing challenges and opportunities related to 3-D printing. Refreshments and a social hour will immediately follow the presentations for a chance into interact and collaborate with faculty from across colleges. This month’s speakers are Associate Professor of Graphic Interaction Design Ashley Pigford, Electrical Engineering Professor and Director of the Electromagnetic Materials Laboratory Mark Mirotznik and Stratasys CTO Jon Stevenson. Pigford will present his creative research involving a computer numerical control (CNC) router as a tool for creative production. He will discuss a recent project involving the production of modular wood type for letterpress printing. Mirotznik will give an overview of his research on functional additive manufacturing as well as the new Delaware Direct Digital Manufacturing Institute (3DMI) that is launching soon. Stevenson, who works for Stratasys, the worldwide leader in 3D printing and services, will speak upon the opportunities and challenges of 3D printing. “We want to create a casual environment where like-minded faculty can come together and share information about what they’re doing, find out about new things happening on campus and hopefully meet potential collaborators,” said Martha L. Hall, PhD candidate in BIOMS and director for The Idea Network, a media and public relations agency. Hall was inspired to organize the happy hours when she realized how little faculty knew of each other outside of their own departments and concentrations. Each happy hour will feature a different topic of discussion from virtual reality to robotics. The series will conclude on April 19, 2018 with a “maker crawl”, a mobile happy hour in which participants visit a handful of the centrally located maker spaces, ending with the VDC.